Use a Scatter Diagram to investigate the possible relationship between two variables that both relate to the same event. When you have paired numerical data. 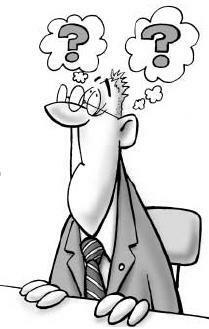 When trying to identify potential root causes of problems. After brainstorming causes and effects using a fishbone diagram. To objectively determine the relationship between a particular cause and effect. When determining whether two effects that appear to be related both occur because of the same cause. 1. Collect pairs of data where a relationship is suspected. 3. As in the below graph, Look at the pattern of points for a obvious relationship. If the data clearly form a line or a curve, you may stop. The variables are correlated. You may wish to use regression or correlation analysis now. Otherwise, complete steps 4 through 7. 4. Divide points on the graph into four quadrants. Let X be the number of points on the graph. 5. Count X/2 points from top to bottom and draw a horizontal line. 6. Count X/2 points from left to right and draw a vertical line. 7. If number of points is odd, draw the line through the middle point. 8. Count the points in each quadrant. Do not count points on a line. 9. Add the diagonally opposite quadrants. Find the smaller sum and the total of points in all quadrants. 14. 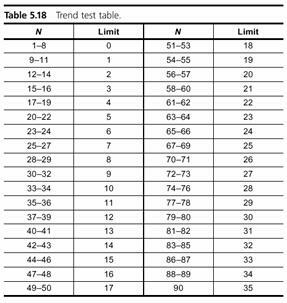 Look up the limit for N on the below trend test scatter diagram table. 15. If Q is less than the limit, the two variables are related. 16. If Q is greater than or equal to the limit, the pattern occurred from random chance. 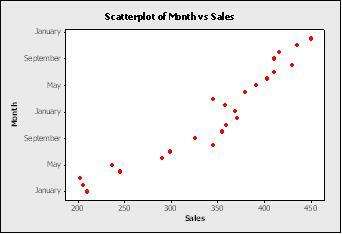 If you want to see how regression relates to the scatter diagram, see this page.